About a month ago, when I was writing my post about Zami Girl, I had a look on Discogs to see what else the ä Records label had released. That led me to Saundra Williams and my interest was piqued. I found a scatchy vinyl rip of the track on a blog, but the MK mixes - that I'd never heard of before - were pretty damn good, so I ordered the CD through Amazon. The CD finally came through today, apparently haing taken its merry time by travelling via New Zealand. Very odd. Saundra Williams was active in the early nineties, although she's still ticking along today. 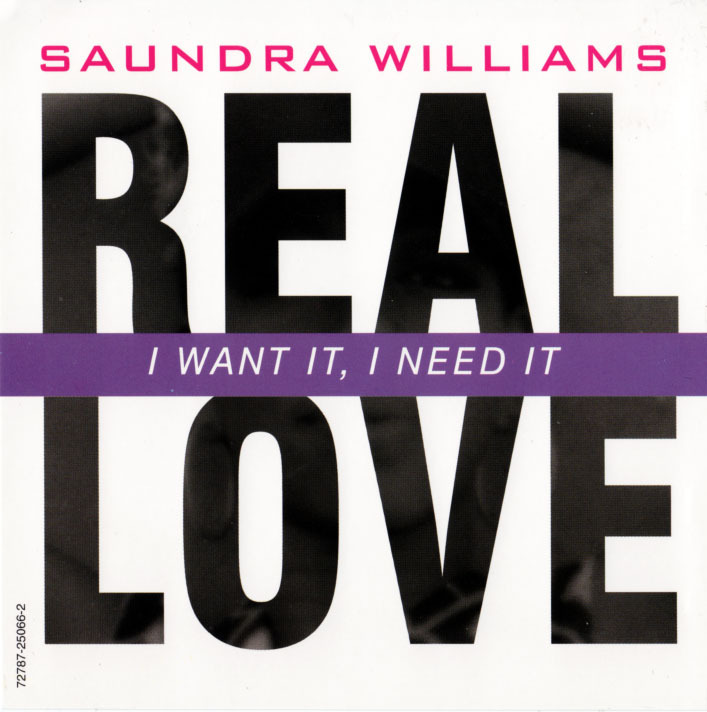 Her website is clunky, has butterflies buzzing round it, an excruciating bio and - best of all - a welcome song that launches with the homepage, with Saundra herself singing a special sultry R&B number, "Welcome to Saundra Williams dot com". Fabulous. Although her site says once you've heard her you'll never forget her, I Want It, I Need It (Real Love) has not found its place in the garage hall of fame. Perhaps the catchy name had something to do with it? It sounds much like a Robin S copy, but the song isn't half bad, and the MK mixes have aged rather well. I decided to take the MK vocal and dub and put them together, to form one 13-minute whole. The two mixes were not at the same BPM, which is unusual, so the dub is basically pinned onto the end of the vocal. Not rocket science for sure, but nice stuff all the same. or an iPod-friendly AAC file here (26MB).